My dear friend Tina used to make this for my husband and I and it is is one of those comfort foods that is WORTH the carbs and fat and calories. It is crunchy and fresh; silky and salty; and just plain delicious! A really great option for any BBQ or pot luck. It looks festive too! This recipe serves 6 to 8 people as a side dish but it is easily doubled to feed a larger crowd (leftovers of this salad are ALWAYS in high demand in my house). Cook Minute Rice as per directions on the box and cool. Add rice to a large bowl and stir in chopped veggies and feta cheese. 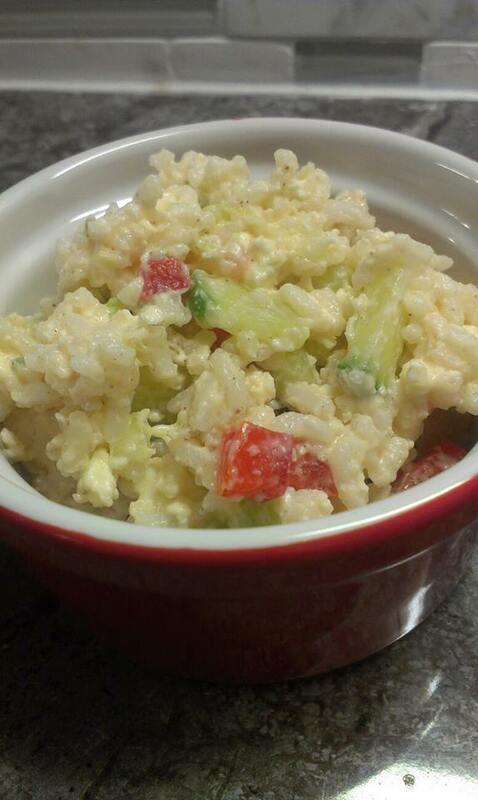 Combine Miracle Whip and yogurt and toss into rice mixture. Season with salt and pepper if needed and cover. Chill at least 2 hours or overnight before serving.